^ Minton, Anna (2012). Ground Control (2nd ed.). Penguin. オリジナルの20 June 2012時点によるアーカイブ。. https://web.archive.org/web/20120620115013/http://www.annaminton.com/Ground_Control.htm 2012年6月25日閲覧。. ^ TIQ Stratford City. "Stratford Renaissance Partnership", Lend Lease. Retrieved on 27 January 2014. ^ Unattributed. "East London’s Glasshouse Gardens launches in Singappore" Archived 17 February 2014 at the Wayback Machine., Property Report. Retrieved on 27 January 2014. ^ Morby, Aaron. "Lend Lease London Stratford resi towers approved", Construction Enquirer. Retrieved on 27 January 2014. ^ NLA. "The International Quarter" Archived 24 February 2014 at the Wayback Machine., NLA. Retrieved on 27 January 2014. ^ Starboard Hotels. "TIQ Stratford - New East London Hotel Development" Archived 24 February 2014 at the Wayback Machine., Starboard Hotels. Retrieved on 27 January 2014. ^ Olympic Stadium set to host 2017 World Paralympic Championships. Telegraph. Retrieved on 17 July 2013. 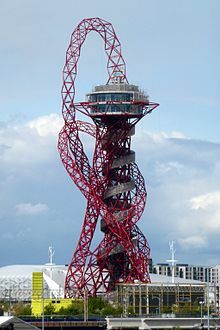 ^ BBC Television (19 June 2014) "Lee Valley: Latest Olympic Legacy Venue Opens in Stratford BBC London News. Retrieved on August 2014.